I was overjoyed! I’d just found out that Judy was pregnant and was so happy! She was mad, disgusted and didn’t want the baby. She was wanting to get rid of it. I was shocked and wouldn’t have any part of this. I told my parents and they decided that we needed to go to El Paso to see her in person. I agreed so we went down that same weekend. To say she was happy to see me wasn’t the case. Like I said she was angry, VERY angry. I couldn’t blame her but it was both of our faults. We were careless and now we had a decision to make. We could move on with our lives or end a life. She said she hated me. She said ugly things. I took it all. I was crying she was crying. I was naive to the fact of why she didn’t want to have this child. Why she didn’t want to be with me. Seeing it now it was because we we young. We’d only been going out for six months and in that it was a long distance relationship from the very start. I should have known it wasn’t going to work out and left it at that. But now that wasn’t an option since a life was on the line. I told her what I wanted to do with my life and told her I was joining the Navy. There I could provide for the baby and her IF she wanted to get married. More ugly things were said by her and again I took it all. I again told her we could be married have a life and provide a stable environment for our new family if she wanted that OR I would go on my way and provide for just the baby. So she decided and we did get married. I joined the Navy. I went to San Diego for Boot on May 10th, 1987. On June 28th Veronica Diane Tessler was born!! I was so happy! I graduated a week later and reported to Damage Control A school and graduated second in my class. I attacked my school work for my family. I was going to prove to Judy that I was dedicated to our new family and that I would be a good father. Even though my marriage to Judy didn’t work out it happened for a reason. She couldn’t handle the military and I have now accepted that. She wasn’t met to be away from her family. God had other plans. 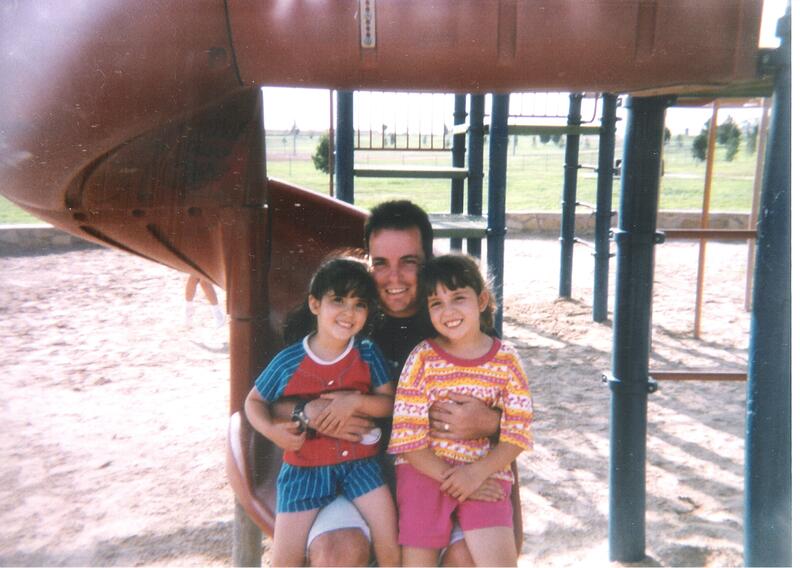 I have two wonderful daughters and would never give up the years I had. I wouldn’t change a thing. I learned a lot from being married and have many many life lessons from that first marriage. All I can say is BE SMART!! I was not. We were not. We were kids and didn’t see that. God has a way of showing and forcing people to grow up. That is what God showed me in my first marriage. How has God forced you to grow up? I worked for a company in Albuquerque named Rainbow Air. Rainbow Air was a company that sold air purification systems. Air purification system that doubled as a what come people would call a vacuum. The “Rainbow”. I had to go to peoples homes demonstrate this equipment basically cleaner house and try to sell them $1000 vacuum. This was right after high school around 1985 so a thousand dollars for a vacuum back then was a lot of money. This kind of job was new to me because I’ve never sold anything before. But it was fun because they taught me a huge demonstration and I really liked it. I would stand up in peoples homes be all nice and quiet and then just go nuts! The owner of the company was skeptical of hiring me at first, but as soon as he saw me do the demonstration he knew I could do it. The fact that I was so quiet and reserved while learning this and then once I did my demonstration I would go crazy really inspired him and me. He was very enthusiastic and always wanted a sale I on the other hand would always go look at the consumer as not being able to afford it. I believed in the product but the price was way too high for what I found out later on. They bought them for $400-$700 that’s how we were able to knock $300 off the price of somebody couldn’t afford it. My other issue was finding people to sell it to I had to go totally off referrals and a lot of people didn’t like getting other peoples names out to have some crazy guy coming to her house and do a demonstration jump all over the carpet to sell them a thousand dollars vacuum. But while I was there I won to trip to Mazatlan Mexico. We had to drive to El Paso Texas meet up with another group of people that work at the same company in a different state and we drove to Juarez Mexico. While I was there I met someone. Her name was Judy and she turned out to be my first wife. The relationship I believe was doomed from the start to begin with. She lived in a different state from me and it was a long distance relationship and we hardly ever saw each other so when she got pregnant to our own faults I wanted to marry her to do the right thing. My parents offered to drive me to El Paso to talk with her to find out what the situation was at that time and she told me she didn’t want to have the baby which broke my heart because I loved her and I loved the baby inside of her. So that’s why I joined the Navy to prove to her that I wanted to get a job and be able to take care of her and the baby. So in essence I joined Navy to get medical insurance to provide for who is now Veronica and to do my dream job which was to be a firefighter and to get a trade out of the Navy and become a civilian firefighter. So once I heard that she was pregnant I went to a Navy recruiter I got the job I wanted and had to fly out to San Diego California for Boot Camp this all happened within six months eventually we I got married in April and I flew to Boot Camp in May and Judy had Veronica on June 28, 1987. The ironic part of the story is that when we were flying back to Juarez our group got off the plane and the plane continued to California. That plane crashed on the way. Everyone died. God has a plan. A plan for everyone.